We have TONS of bags that we cannot sell due to small defects. It will be such a waste to throw them away, so we decided to sell them at a lower price instead, for RM 5 each, same as totebags sell at bundle shop, except that our reject bags has not yet been use! If you purchase more than 20 pieces of any products on our website, you can request for 1 free reject bags. It can be use as a try-and-error piece, before you do your DIY project, printing / handpainting. During your purchase, in the comment section, write the code bag of the reject bag you would like to request. Any product! list down a few codes, in case the bag you request is not available. If there is no comment, we will not give any free reject bags. Example: CODE: 004 - REJECT BAG. we will try to pick the least defects bags for you, so you can cover the defects by printing / paint on it. then...tadaaa, defects all gone. 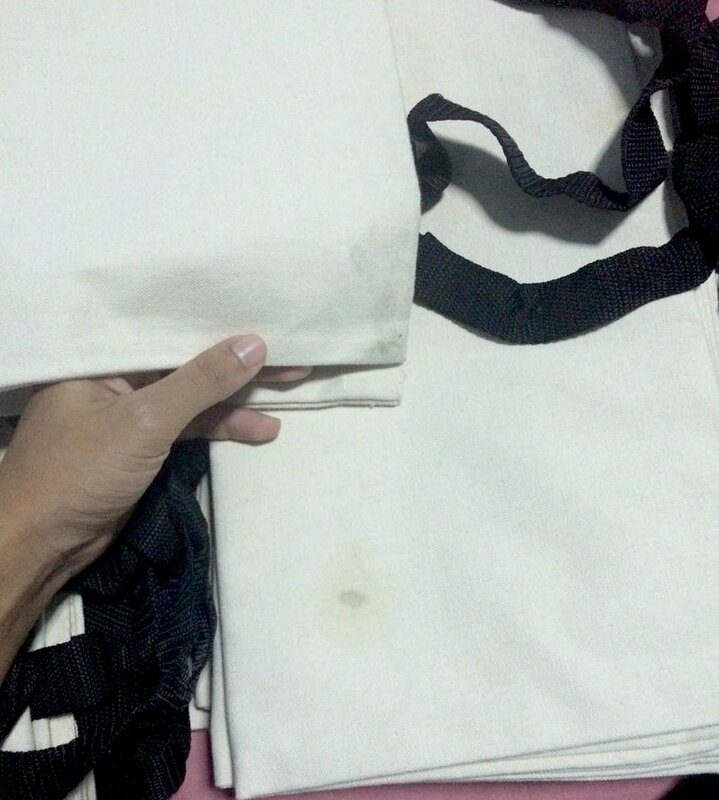 The defects on the handles/ bags are normally small stains, which you can cover up with paint / print. We will not give you torn bags / huge stains! Most of our drawstring bags, are perfect! but defects are on the handles, which have tangled knots. Example: code: DS89 - dont mind any tangled knot on the handles. We only charge RM 3 for any reject bags, on any quantity you buy, whether it is to Sabah Sarawak or Semenanjung. Not applicable with any other purchase, only for reject bags. But due to the system set on our website, min postage charge will be RM 6. We will refund balance in the parcel. Sorry for the inconvenience.